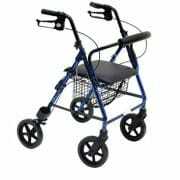 Rollator with 2 fixed and 2 swiveling wheels, foldable, painted aluminum. 4 wheels of 18.5 cm diameter, thickness 3.5 cm. anatomical handle height adjustment for maximum comfort. 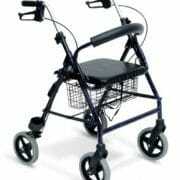 It equipped with dual function brakes on the rear wheels. Easily foldable to be stored and trasportato.perfetto Light esterno.molto use. Supplied with seat, tray and storage bin. Seat 54 cm from the ground. Adjustable in height from 83 to 95 cm. Max bearable weight 100 kg.